Hi friends! Thank you so much for following along on this fitness journey of mine. This Saturday marks 8 weeks out from the bikini competition. I guess this is where the rubber meets the road so to speak because I have more tweaks to my training and diet. I weighed in today (May 8, 2014) at 108 pounds and 19% body fat. We will be measuring every 2 weeks. Back on April 1, he measured me at 25.5%, so I’ve lost about 6% body fat in 6 weeks. I was also 113 pounds, so I’m down 5, but I’ve gained muscle I’m sure. I’m aiming to get to about 10% body fat, so my trainer said he wants to modify my diet. Well, it’s already so strict, I didn’t want him to cut anything, so I had to fess up that I’m still adding a small amount of peanut butter to my pancakes (and sometimes I eat those twice a day) and I sometimes only get 4 of my 5 meals in. He was very stern about “peanut butter is not on the meal plan” and explained that everything I put in my body counts and makes a difference. Also, getting in those 5 meals is crucial because eating so often is revving up my metabolism and skipping a meal (for me it’s usually the last one) causes my body to store more fat instead of burning it. 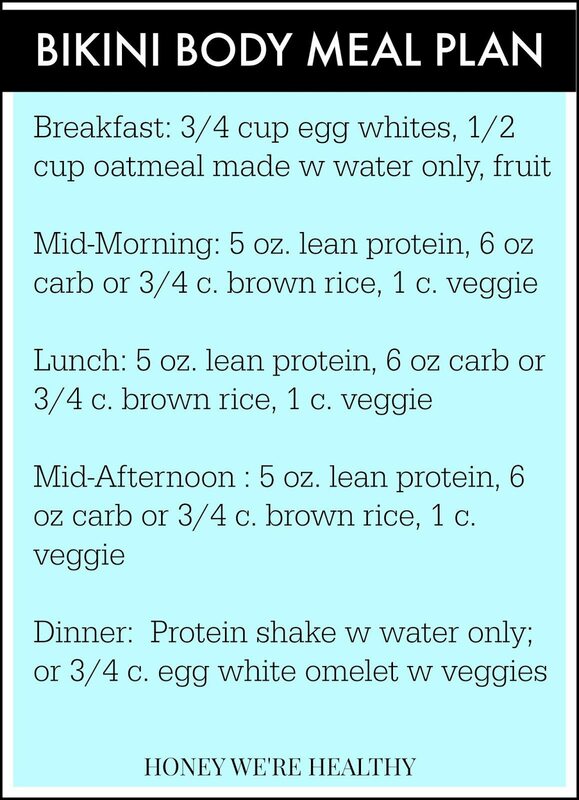 Here’s a reminder of the MEAL PLAN I’m on. 7:30 – 8:00 a.m. 1/2 cup ground oats, dash of cinnamon, 3/4 cup All Whites, 1 real egg white, splash of water (less than 1/4 cup) and make it into a pancake. I spray the pan with spray coconut oil. It’s this last shake that I need to get in. I have had cheerios (oops!) a few times or my pancake with peanut butter, but no more. Eating this way honestly hasn’t been that bad (or as bad as I thought it would be). Once I figured out how to cook my chicken so it wasn’t bone dry, I enjoyed it more. Also, I know I COULD eat whatever I want really- I’m CHOOSING to do this because I want to see the results. I LOVE the impact this eating/exercise plan is having on my body. I’m almost 40 and getting into the best shape ever. We are upping my cardio to 45 minutes 5 days a week. He actually recommended 5-6 days, but dang! AND finally, we are training together about 4-5 days a week- up from 3. I’m doing the cardio right before or after our workouts just to get it over with for the day. This has me pooped people! I definitely need my sleep or I’m so out of steam in the mooring for the workouts. These exercises we do are killer. My heart rate is up the whole time, with maybe a minute rest after 3 sets. Outer leg machine (20 reps x 3- 40 pounds?) Not too bad, weight isn’t that heavy. Maybe I should up it next time? Tire Tipping (outside- down a long row- up and back- 3x) That tire is f*&king heavy. And dirty. My hands were gross. 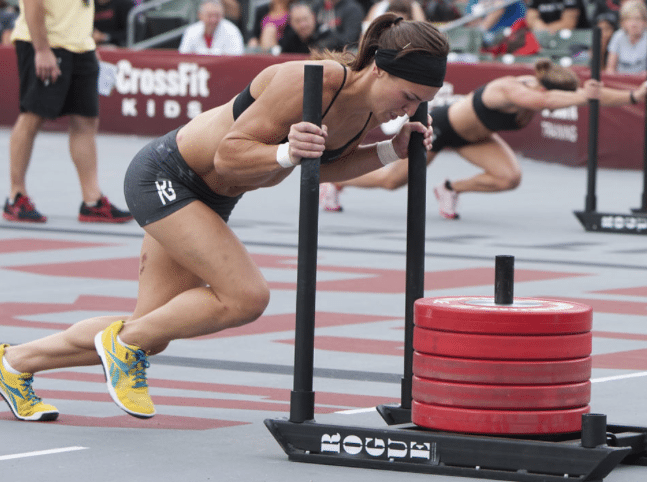 Sled Pushes (outside- down a long row- 3x pushing, then pulling it backwards 3x- not sure the weight, definitely not as much as pictured below- maybe 25 pounds??) Feeling like a sweaty beast. A strong sweaty beast. Step-up on even higher step (12 on each leg x 3) OMG- I’m short remember??!! Bike for one minute (x3) Never has one minute felt longer. Kettle Bell Plie Squats (30lb) my feet were each on a step, and I had to touch the kettle bell to the ground (15 reps, 3x) Dang these hurt, I have to stop mid-way through for a quick second. Legs on fire. Bike for one minute (x3) Are we done yet?!?! Then off to 45 minutes on the treadmill. I alternated walking briskly at 3.8 no incline and incline at 15% at 2.5. 15% is as high as their treadmills go. Sweaty. Sweaty. Sweaty. And hungry. The end. Until tomorrow. OMG. Thats no joke. You are amazing!!! Superwomen for reals. I appreciate it. HARD WORK for sure! Oh.my.heavens! I admire your dedication both nutrition and fitness. I've had a personal trainer in the past that has pushed me further than I though I could go, like I think I might not survive! It's brutal but pain is temporary and you will continue to reap the benefits. You inspire me to continue my workout and nutrition journey!! The personal trainer is extremely important and definitely pushes me harder than I would do on my own. It's good to have his expertise and know that I'm not just spinning my wheels, but will continue to see results. Will post another pic next week. Wow, time is really flying! Before the page loaded, I was thinking that you needed to up your cardio to 50 minutes six days a week so I laughed when I read that. You can tell from some of your fashion photos that you are starting to get leaner. The diet is really important so hang in there. I have no idea how you do it! I sat on the couch and ate jellybeans after dinner… hehe 🙂 I need to have your motivation but I could never do such a strict diet, I love food too much (and desserts!) can't wait to hear all about the competition, you will rock it! You are amazing and so motivating. I have been exercising, eating better and following your blog and I am seeing amazing results. I'm not training like you, but it's amazing what getting off the couch and getting active can do for you 🙂 Kudos to you and post a picture soon! Yowsa! That's a brutal workout. I keep thinking I should increase my workout regimen. I have used some of your workout routines and it has helped break the monotony at the gym. Thanks! So awesome Megan! Those tires are no joke…my hubby made me do some and it sucked…but my booty loved me for it. Again, so so proud of you lady! Happy early Mother's Day!!! I am so pumped for you! It's crazy how my brain gets for Peanut Butter during prep. I just can't have it in the house AT ALL! No control. Somethings that got me through that was instead of drinking that last bit of protein as a shake, I mixed just enough water in my protein powder to make it the consistency of peanut butter. ahmahgah….it's so good. Not real life good, but comp prep good. It's funny how your definition of "good food" changes while in prep! ha! Also, cucumbers were always an unlimited food for me because they are basically water…so I ate a lot of PICKLES (just cucumbers soaked in salt). And I chewed A LOT of gum! Hang in there, girl! You are doing AH-MAZING!! Keep up the great work! What kind of protein do you use for your shake? Rice? Casein? I use whey protein and now drink Muscle Egg. Megan, I'd love to see a post on your chicken and how you dont get it to cook so dry! I have that problem! Keep up the AWESOME work! I put the microwave on defrost (50% cooking) and would check it every few minutes- probably took 5-10 minutes if I remember right. I honestly can't recall now because I haven't cooked it that way in a long time. I've been buying fresh now since I don't eat as much. Ditto on the chicken recipe! Love following your journey! Hi Angeline, so sorry I missed this earlier. My trainer is John Sherman, he's near the Galleria. Email me if you want his contact info. I thought I already posted this but I guess it didn't work. I know im pretty late stumbling upon your blog but I was just wondering if you measured your 3/4 cup rice before or after you cooked it. Thanks!